We have just released a new version with two new translations: Greek and Italian thanks to Vassilis Oikonomou and Luca Sasdelli. 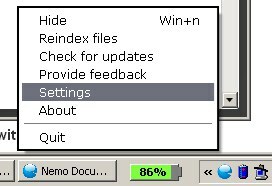 Also font rendering has been tweaked a bit so that Nemo Documents now uses ClearType by default. If this causes any problems or you would rather have it the old way, then you can go to settings and advanced options to disable it. We did some tests on Windows XP and Windows 7 and found the result to look a bit nicer than without ClearType. The change was prompted by the discussion in the following thread. This entry was posted in Uncategorized and tagged .NET, fonts, fuzzy, release, rendering, WPF. Bookmark the permalink.